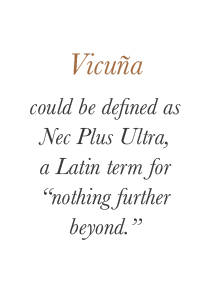 Vicuña is a camelid that roams the Andes Mountains of Peru, Chile, Bolivia, and Argentina. 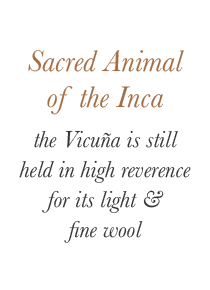 Historically, it has been revered by the Inca Indians for its precious wool. 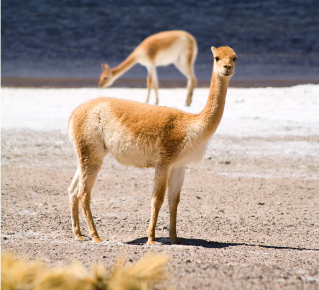 Part of tradition called chaccu, once every four years they would gather wild Vicuña for shearing and releasing the animal. 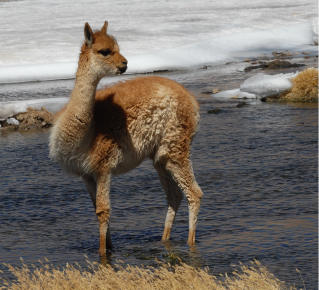 Capable of surviving the cold, arid climate of 12,500 to 13,000 altitude, the vicuña grows an extremely fine (only 12.5-13 microns in diameter), short, and dense fleece with an overcoat to protect from the elements. 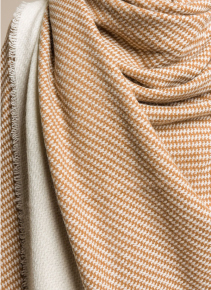 This exceptionally fine golden wool becomes one of the softest natural fibers, second only to silk. 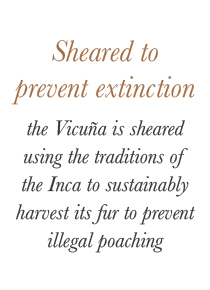 Due to its incredible rarity (adults producing only 120-150 grams every two years) and luxurious quality, the animal was on the verge of extinction because of illegal poaching. 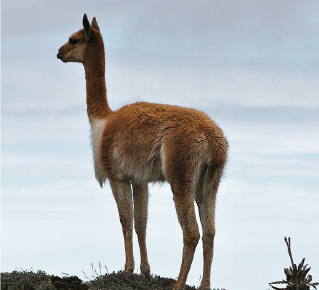 In efforts to prevent the poaching, the government had placed strict guidelines to catch, shear, and release all vicuña in a cruelty-free manner. 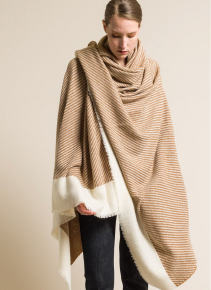 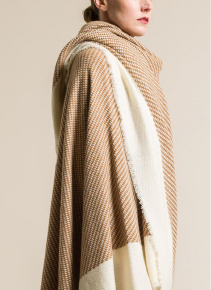 Alonpi Cashmere has created a vicuña and cashmere shawl, with legally sheared vicuña wool.